Native Americans from the Bering Sea region have always believed that everything in nature is not only physical, but also has a powerful spirit. Many archeological sites show that, as early as 10,000 years ago, Paleo Native Americans were wearing earrings made from natural materials such as abalone, walrus and mammoth ivory, found pebbles, shells, etc. These earrings were probably thought to possess special powers of protection associated with the spirit of the piece. When the Russians began to explore and trade in this region in 1740, it was natural for the natives to begin to use the new trade goods such as beads, in conjunction with their older natural materials, for jewelry such as earrings. 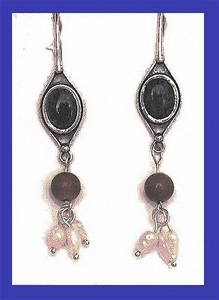 Our contemporary interpretation is of a pair of earrings which were originally made with abalone shell. (Note that the shimmer seen in abalone shell, pearls and in the fringes of weavings is considered a manifestation of the spiritual power of the garment or adornment.) The Tlingits, especially, began to design and wear in the Russian tradition � with freshwater pearls, mammoth and walrus ivory beads and abalone, as well as seedbeads and gemstones. The forms, however, took their shapes from traditional ancient Tlingit designs. Our Tlingit earrings are made with such materials: Sterling Silver earwires hold a beautiful shimmering blue opal. Our design exchanges this opal for a similar piece made from abalone shell. The shape of the Sterling Silver, its rim, as well as the shape of the opal, are quite reminiscent of the inner eye of traditional Tlingit hawk and eagle designs. The opal is set in a fully backed Sterling Silver dangle, from which hangs a large dark, 25,000 year old Fossil Mammoth Ivory bead and three freshwater pearls. A really stunning pair of earrings which will shimmer for you every time you wear them. 2 � inch high, � inch wide.